A commuter train derailed outside South Station, causing delays on multiple commuter lines. A minor derailment outside Boston's South Station caused delays on MBTA Commuter Rail lines. 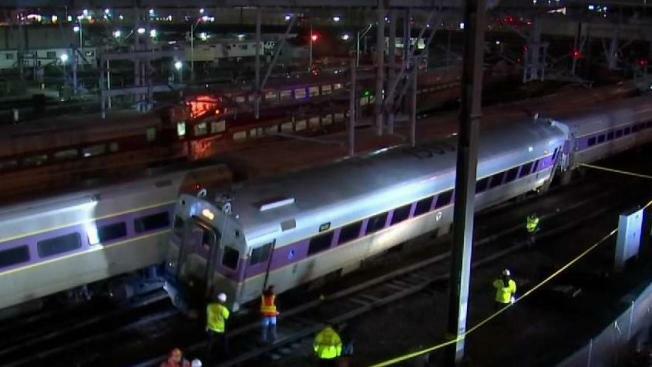 Transit officials said a Fairmount Line train derailed at a low speed around 8 p.m.
Four passengers and approximately six workers were on the train, but no injuries were reported. A representative from Keolis, the company that operates the commuter rail, said an out-of-service commuter train hit another train, causing three coach cars to derail. Delays and cancellations were announced on the Fairmount, Middleborough/Lakeville, Kingston/Plymouth and Greenbush lines. Service between Newmarket and South Station on the Fairmount Line was being replaced by a shuttle bus. Keolis said it did not know what impact the derailment would have on the morning commute.